Although it feels like I’ve only just started, I will be finishing my traineeship in a few weeks time. These few weeks are looking as busy as ever. Plus, because I’ve been so busy this year, I’ve forgotten to take most of my holidays so I’m starting my Christmas holidays early, so I thought I best write my last blog post now! I am in the midst of job applications and trying to finish everything off before I go. I’m panicking because I have no idea what I’ll be doing come the new year but I’m strangely calm about it all at the same time. At least I have lots going on to distract me! First, a quick November update. This month has been equally busy, I thought things would slow down in the autumn but that has not been the case for me. I started the month is the best possible way, digging up worms. I used to get told off for doing this when I was little but now I’m encouraged to do so! The FSC have been working with a local farmer to study how changing to more sustainable farming practices can increase worm abundance and diversity, which in turn increases soil quality. The project was handed over to me so as well as studying 8 legged things this year, I’ve also been looking at 0 legged things. This has involved digging up soil pits to measure the abundance and species richness of earthworms. 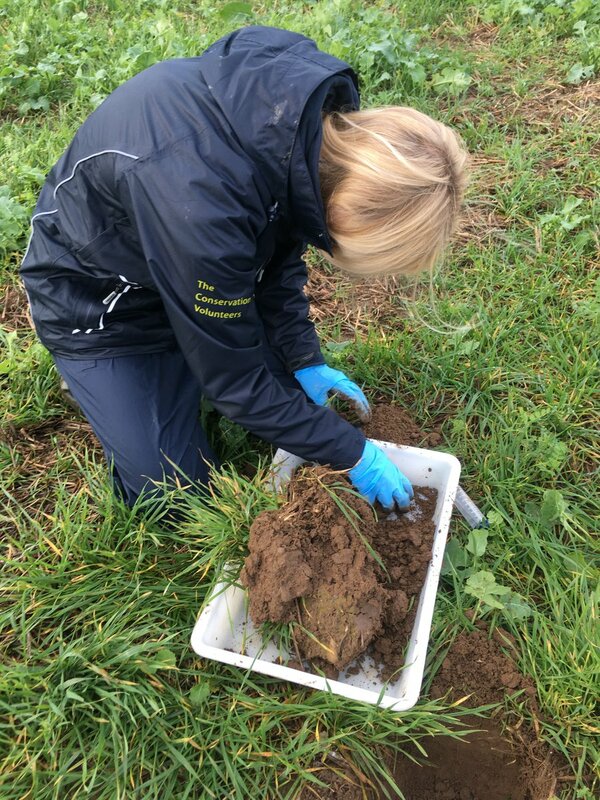 We have also been taking soil cores to measure bulk density, soil moisture content and organic matter content. We spent three days collecting the second batch of samples at the start of November, the data is currently being analysed and ‘m hoping I can finish off the report before I leave. The results will help inform the farmer on the best field management practices for biodiversity and soil health and will be published in the field studies journal to help inform others. The week later, I was off to Edinburgh for the final Natural Talent 2018 meet up and our showcase event. The purpose of the event was to show everyone involved in the Natural Talent network what we’ve been up to this year. The morning consisted of a series of talks from trainees past and present, followed by a drop in session in the afternoon, so members of the public could find out all about the species groups we’d been studying. It was a strange day as we (as in, all of this years trainees) realised it was probably the last time we’d all be together. Time has flown by but it was great to have one last catch up before we all go our separate ways. 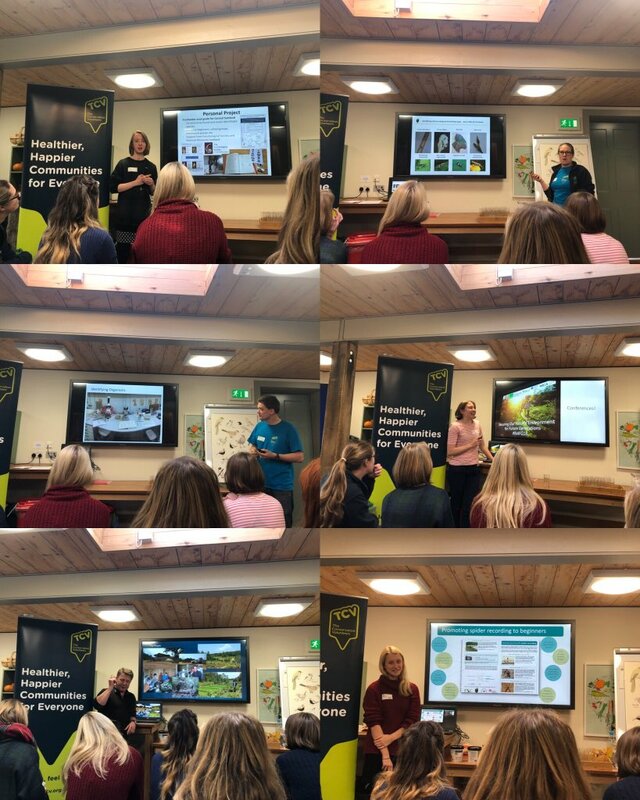 The talks from previous trainees proved just how useful Natural Talent is in terms of providing the skills and experience needed in the conservation sector, with all of them going on to work in conservation. I’m sad that Natural Talent is ended and that I’m part of the last cohort of trainees. On the other hand, I’m really glad I got in just in time to make the most of this excellent opportunity. I’ve had a blast and judging by everyone else’s talks at the showcase, they did too! Thanks to Kirsty for the photos – I forgot to take any! 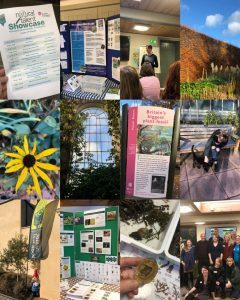 The week after that I then went to Nottingham for the 2018 National Biodiversity Network Conference. The theme of this year’s NBN Conference was “The NBN in a changing climate”. The NBN collects, maps and shares all of the biological records for every species in the UK, it’s basically the national environmental records centre. Over the course of the two days conference a range of speakers covered topics such as data from citizen science, data for delivering environmental planning, tools for online resources, species in changing environments, using species and habitat data to prioritise biodiversity action, and improving biodiversity on farms. The first day of the conference had an unintentional spider theme, with talks from Dr Adam Hart and Dr Sara Goodacre about their spider research and public engagement. This worked out well for me because during the breaks I was manning the FSC stand handing out copies of my spider guide, so it was in high demand. 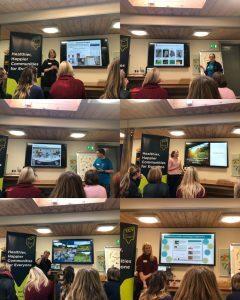 It was a really interesting and useful conference for me as I made lots of new contacts and met up with another arachnologists I’d only ever spoken to online. My identification skills have massively improved, not just for arachnids but for invertebrates, mammals, reptiles and amphibians because I’ve been able to take the time to go on lots of courses, practice my ID skills and read lots of books this year. I’ve also created my own identification guide (big thanks to the FSC publications team for making this happen!). I’ve gained more science communication experience, writing copy for blogs, using social media to promote what I’ve been doing and talking at conferences. My teaching and engagement skills have improved. I’ve helped teach and taught my own courses this year, and helped run various engagement activities so I’m far more confident when it comes to this side of things now. If I was asked to teach a course or talk at a conference this time last year, I would have run for the hills. I hated public speaking but Natural Talent has helped me overcome this and I have been actively looking for opportunities to talk to/teach people. I’ve gained experience managing projects and budgets. This should hopefully help me get a job. Things haven’t really changed since I started the traineeship in terms of the career I wish to pursue. I’m still hoping to find a project officer job with a conservation charity. Having studied and worked in conservation before, I’ve missed that side of things this year as I’ve spent more time talking to people than bracken bashing. I’m not complaining, it’s been a nice change and I’ve gained lots of new skills that will help me in this sort of job, as they generally consist of a mixture of conservation and engagement work. I would like to thank Amy and Tim for making Natural Talent happen, I’ve had a blast this year and I think all of the new skills and experiences I have listed above highlight just how useful it’s been for me. An extra big thanks to Amy for all of her help and encouragement throughout the traineeship. Thank you to the rest of the 2018 gang for making it so much fun. A big thanks to Charlie, my mentor at the FSC. She’s given me so much help and guidance this year and she’s encouraged me to make the most of every opportunity that’s come my way. Thanks to Sue and all of the FSC Biodiversity team for having me, and for their constant support. Finally, I would like to thank Esmee Fairbairn for funding this excellent opportunity. It feels very strange saying this but, that’s all folks!